Testimonials - Boston Real Estate Attorney. Eviction Law. Zoning and Variances. Housing Discrimination. Emil helped me through a time with a difficult tenant, and for his quick and reasonable advice, I am grateful. 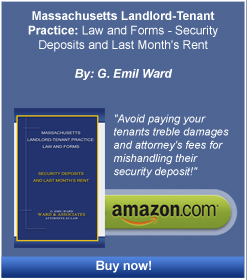 When a security deposit is dubbed, last month’s rent, and no recourse is clear, Emil (and his book) had many suggestions I found not only interesting but very helpful. Emil knows the law and when tenants choose to ignore it, he would be my “go to guy”. Thank goodness for his sense of humor too! – Herbert Riggs, President RJRB, Inc.
Emil Ward was exactly who we needed to help us resolve the situation with our tenants; there is no way we could have proceeded without him. Our tenants were lawyers who showed a lack of attention to details prior to moving in but then proceeded to use their knowledge of the legal process to withhold rent and make accusations in any and every aspect they could, from habitability to lead to incompetence. Caught off guard and uncertain of our rights or our legal obligations, Emil Ward helped us gain clarity and perspective, and forge a path to end the dispute and reach a peaceful solution. Most importantly, Emil was patient and pleasant to work with, and made a painful situation much easier to handle. Emil’s counsel is well worth it! I am a real estate agent and I recently worked with Attorney Ward on a residential real estate sale where we represented a difficult buyer. Attorney Ward went over and above the call of duty, keeping both buyer and seller sides focused on the end game; the sale of the property. He handled a number of issues and concerns from both parties with professionalism and was a key component to bringing this sale to the closing table. This was our first transaction together and I found Attorney Ward to be not only professional and completely competent but a pleasure to work with. I highly recommend him and look forward to working with him again soon. I worked with Emil when there was a tenant issue. Emil was so confident in what he was saying and doing, and I was able to totally count on him. He seems to have worked only for landlords for years. His expertise was something a landlord who has an issue can totally rely on. He represented me for important things in an excellent way, so that I can resolve issues. When I asked him questions, he usually had solid answers. Great landlord lawyer. Attorney Emil Ward is affable, a good listener and easy to talk to. He has always treated me in a collegial but highly professional manner. Emil is easy to work with. He makes a point of asking me if he has answered all of my questions every time we speak. He also has made a point of offering me the option of doing some of the preliminary non­legal document preparation myself. This has reduced the number of hours he has worked on my behalf and has saved me money. Emil has helped me on several occasions with landlord-­tenant issues. On very short notice he has given me expert advice in situations with rapidly approaching deadlines. He has helped me craft landlord-­tenant agreement documents that put me in a very strong legal position regarding rapid resolution of landlord­-tenant conflicts. This will minimize my need for legal advice in the future. In summary Emil has been very pleasant to work with, given me expert advice, worked on short notice, kept charges low and minimized my need for future legal services. I highly recommend Attorney Emil Ward.